A new pension scheme Pradhan Mantri Vaya Vandana Yojana is notified the government for citizens aged 60 years and above. Accordingly, new LIC Pradhan Mantri Vaya Vandana Yojana (PMVVY) Plan 842 is launched on 4th May 2017. This plan will be available for sale up to 3rd May 2018. As we know that in India we don’t have any social security scheme. So, the earlier plan Varishtha Pension Bima Yojana (VPBY) and new Pradhan Mantri Vaya Vandana Yojana (PMVVY) is expected to give social security to people up to some extent. This is a government subsidized pension scheme which shall provide an assured return of 8% per annum payable monthly (i.e equivalent to 8.30% per annum) to the pensioner surviving during the policy term of 10 years. The detail information about LIC Pradhan Mantri Vaya Vandana Yojana (PMVVY) Plan 842 is given below. Pradhan Mantri Vaya Vandana Yojana is a single premium payment pension plan. This pension plan offers an option to choose either the amount of pension or the Purchase Price. 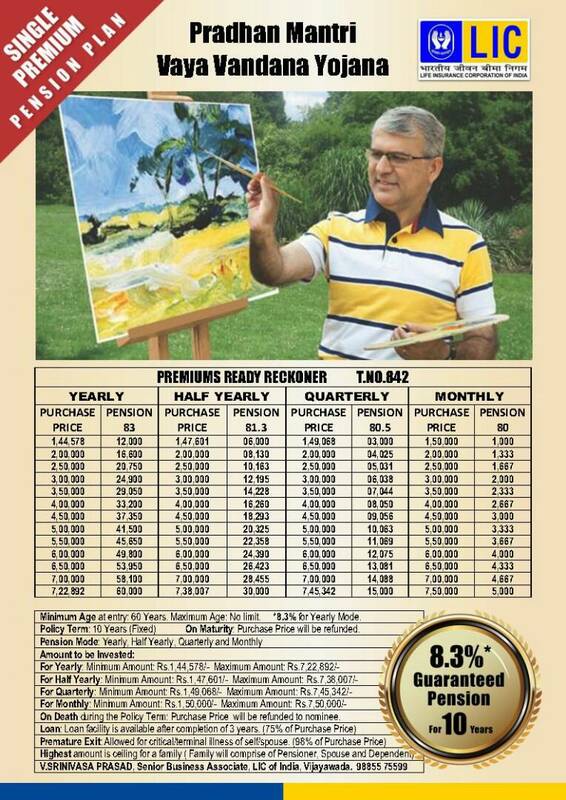 The minimum and maximum purchase price under different modes of pension will be as under. The maximum pension limit is applicable for a family as a whole. The mode of pension payment under this plan shall be monthly, quarterly, half-yearly or yearly. The pension payment shall be via NEFT or Aadhaar Enabled Payment System. You can surrender policy during the policy term under unavoidable circumstances like critical illness of self or spouse. You can avail loan facility up to 75% of purchase price after completion of 3 policy years. Pension payment – On survival of the pensioner during the policy term, Pension shall be payable as per selection of mode. Death benefit – On the death of the policy holder during the policy term, the purchase price shall be returned back to the nominee. Maturity benefit – On survival of the pensioner to the end of the policy term, Purchase price and final pension installment shall be payable. The monthly pension will be 8%. (equivalent to 8.30% per annum). Accordingly, the pension rate for Rs.1000/- purchase price for different modes of the pension payment is given below. The graphical presentation of Pradhan Mantri Vaya Vandana Yojana (PMVVY) is given below. On review of PMVVY, I could find following shortcomings. Maximum Pension – The maximum pension offered under this plan is Rs.5000 per month, which is very low. It is peanut type amount and It is very difficult to survive with Rs.5000 per month pension. Age Factor – This plan is available for a senior citizen. Entry in this plan is allowed after retirement age 60 years. Ideally, everyone does retirement planning before retirement. No one waits up to retirement age. Insurance Cover – The maximum insurance cover offered by this plan during policy term is equal to maximum purchase price i.e Rs.7,50,000. Looking at growing inflation and family need the insurance cover offered by this plan is very low. Returns – The tagline of this product is 8% assured return per annum. At a first glance, it may look attractive. However, if we consider returns offered by other financial products returns offered by this plan is average. Single premium plan – It is a single premium plan. So, in order to purchase this policy, you need to pay minimum 1.5 Lac as a premium (pension Rs.1000). If you want higher premium you need to pay more premium. No Liquidity – The requirement of money in old age is very high. However, this plan does not offer any liquidly except loan facility after three years. The only positive part about Pradhan Mantri Vaya Vandana Yojana is backing of LIC and Government. If you are ok with all shortcoming mentioned above, you can purchase PMVVY policy. What about the latest updates? Post Budget ? Can you kindly share the updates like closure of the scheme, maximum amount etc? It’s premium payment is cover 80c or not? There is no tax benefit in purchasing this plan or on the pension amounts received through this plan. This is some what like a fixed deposit for ten years. the interests is 8% (or 8.3%) on monthly payment of interests. but private sector like DHFL and Shriram give 8% for 12 months deposit. particularly the interest is taxable. So in what way this is better unless as this is LIC it is more secure. discuss this point in your next review. 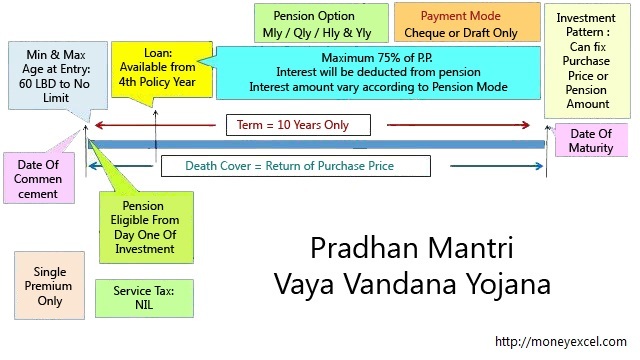 Pradhan Mantri Vaya Vandana Yojana (PMVVY) – In this plan , is pension is taxable or not. Pension payable in Pradhan Mantri Vaya Vandana Yojana is taxable.